Alina Somova: quite possibly the prototype of the 21st century ballerina, indisputably a star in the making at the legendary Mariinsky (Kirov) Ballet in St. Petersburg. Her phenomenal extension and technique reveal new possibilities for classicism, expanding the boundaries of ballet’s lines and steps. Alina has exquisite long limbs and total mastery of them; her adagio is riveting – achieving and sustaining astounding positions. But the slender, almost fragile-looking blonde is also a powerhouse at allegro, with a soaring, space-devouring jump. She joined the Mariinsky at seventeen and – thanks to talent, training, and an iron will – danced Swan Lake the very next year. 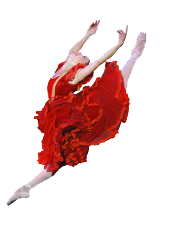 Alina started ballet classes at the legendary Vaganova Academy at age five, and credits all her teachers there for developing her technique. Especially influential was Lyudmila Safronova with whom Alina studied during her last three years at the school. In addition to Odette/Odile, Alina dances Nikiya in La Bayadere, Aurora in The Sleeping Beauty, Medora in Le Corsaire, Sugar Plum Fairy in The Nutcracker, Kitri as well as Queen of the Dryads in Don Quixote, and leading roles in Balanchine’s Ballet Imperial and others. Alina would love to dance more Balanchine, a technique and style in which she immediately felt comfortable. Her favorite role is Nikiya, but she also loves the ballet that was her biggest challenge, Swan Lake, citing the character, the music, and yes, the fouettes. Alina is the first in her family to dance. Her mother enrolled her in the Vaganova Academy for the simple reason that it is the best, but only about one in five girls who apply are accepted there. Her training entailed ballet classes six days a week, plus folk dance, acting, pas de deux, and repertory classes – and rehearsals. Vaganova students also devote four hours each day to academic study; in this Alina enjoyed mathematics and solving equations. These days, her schedule consists of daily class, rehearsal, and often performance as well. In her few moments of leisure, Alina likes to watch soccer. The company takes a well-deserved vacation for the month of August. Alina was intrigued by Gaynor Mindens when she heard other dancers in the company talk about them, so she bought a pair while on tour. The transition was not easy and was made even more difficult by a bad fit in her first pair. Now, after a period of adjustment and a refitting, she wears Gaynor Mindens exclusively. She loves the way they look and she’s not alone: her colleagues have noticed a difference and offered compliments on how nicely arched Alina’s feet are in her new shoes. 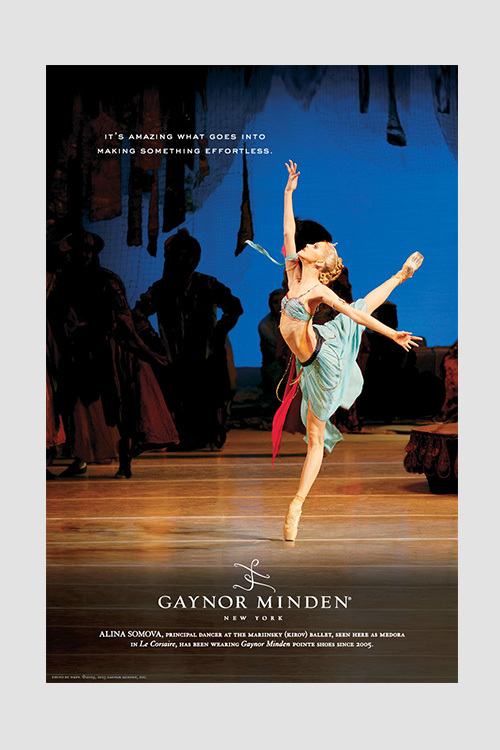 Gaynor Mindens have become a trusted ally, allowing her to always dance at her best as she explores and defines classical ballet of the future.